Laptop USB: From a laptop perched on top of the DS40 and connected via USB. This would be a typical portable setup, preferably with a Windows computer. Desktop USB: From a desktop computer connected directly to the DS40 via USB. As a Shared Printer: From a networked computer connected to the network wirelessly to access the DS40 as a shared printer on the desktop computer which was directly connected via USB. As we detailed in the previous segment of this review, our problems seemed to be restricted to printing from various versions of Photoshop using the Lion driver on Yosemite. But we heard from a number of DS40 users who had other problems printing from Yosemite with the Lion driver, including printing multiple images from Lightroom. Multiple Images. The new driver was able to print multiple images from Lightroom. Printer shows as offline when it is still functional. Your printer may show as 'Offline' in Mac OS. 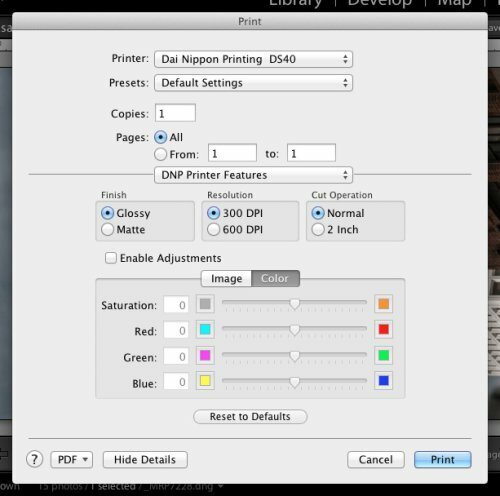 However, even though Mac OS reports that the printer is offline, as long as there aren't any error lights on the printer, the user is still able to print. 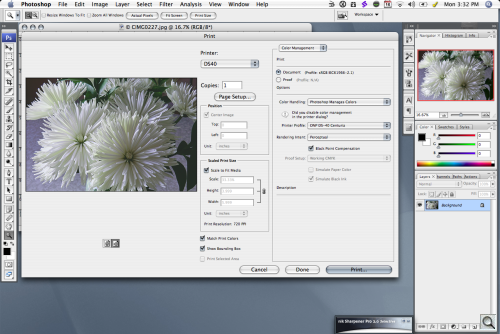 Simply print from the Print dialog like normal and your images will be printed. The driver does not support multiple printers of the same make and model. Only connect one printer of a single model to the computer at any time. While multiple printer queues will be created for each attached printer, the system will no longer differentiate between two or more printers of the same model and will send all print jobs to only one printer. Having printers of different models, i.e., a DS40 and a DS80, is supported. Because we had trouble printing from Photoshop with the previous driver, we installed the Yosemite beta on our machines and retested everything. We did experience the incorrect status report, as warned, but that did not cause an error message. As we report below, the beta driver did permit us to print reliably from Yosemite to the DS40. And that finally permitted us to continue our review with an evaluation of the DS40's print output. As with any print job, you have the option to manage color in your application or to let the printer manage it. We prefer to manage color in Photoshop or Lightroom, where we are tweaking it rather than blindly allowing the printer to tweak our tweaks. So we have to let the DS40 know that. You do that in the driver. Orientation. Think about the paper roll. 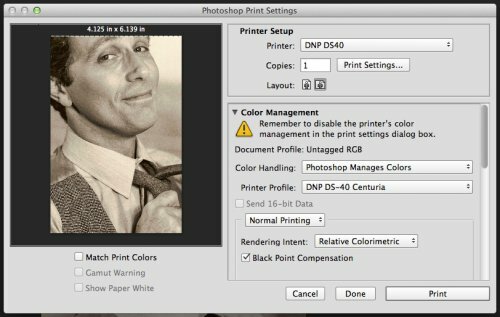 In the Photoshop CC screen shot above, we're telling the DS40 that Photoshop is managing the color using the "DNP DS-40 Centuria" printer profile (the only one DNP supplies). If you prefer to let the printer manage color, you won't need to indicate a printer profile. You won't be able to control the results either, though. Note also in the screen shot a little oddity in the Layout section. We clearly have a portrait layout, yet the driver is selecting landscape. That may look incorrect but in fact, a 4x6 print is printed on only half the 6x8 area. That half is in landscape compared to the 6x8 portrait. The DS40 driver itself has several important options. DNP Driver. Setting Resolution, Finish and Cut Operation. Resolution can be set to either 300 dpi or 600 dpi. Because a dye-sublimation print is a continuous tone print and not screened, 300 dpi is sufficiently sharp. Color is transferred as a gas that bleeds into the paper as much as the image requires it, so it truly is continuous tone. Finish is either Glossy or Matte. Matte is achieved by an extra pass over the image after the clear coat has been applied in which the heat is cranked up to crinkle the clear coat. It works surprisingly well, applying an even, microscopically wrinkled surface to the image that diffuses the light in all directions, thus creating a matte coating. Finish. 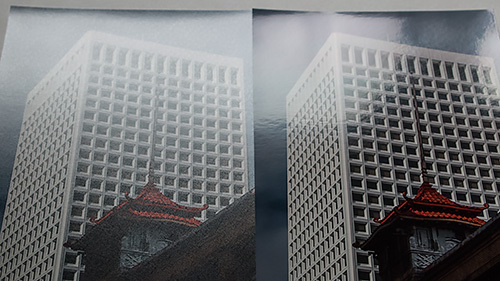 Same image printed with a Matte (left) coating and a Glossy coating. Cut Operation is either Normal or 2 Inch. Normal delivers a nicely trimmed print at the size you specified. The 2 Inch option slices the trim size every two inches. So a 4x6 landscape would be two 2x6 prints. Nice for bookmarks or business cards, perhaps. Apart from print size, which can be set to 4x6, 5x7 or 6x8, those are the only driver settings to worry about. And, yes, the same paper roll handles all three print sizes, trimming the print down from the roll size. We also used an older driver for OS X 10.4, which provided the same options and worked just as reliably. As our traveling laptop solution for printing on site, we were glad we could use an old laptop with the DS40. Mac OS 10.4. The oldest Mac driver worked just fine on a PPC laptop printing from Photoshop CS3. We were a bit surprised that there were no options to reverse the image and to skip the clear coat. That would permit using the print to transfer the image to a coffee cup, for example, by apply pressure to the image against the ceramic cup and baking it in an oven to migrate the dye. But the DS40 is designed more as a production printer than a speciality printer. You'll really need a laptop to function as a kiosk for the printer if you plan to set it up at events. That is, after all, the best time to make sales. Because the DS40 uses heat to migrate the dyes from the ribbon to the paper and fans to keep it within operational specs, it is a very noisy printer, so it isn't suitable for quiet venues. The DS40 does deliver credible color but it was difficult to match some of our edits, particularly of darker images. This isn't an issue for event photography where the client won't have anything to compare with the print. But it is an issue for photographers who make subtle edits. We had trouble, for example, printing a dark hotel hallway scene where the Raw image had its shadows boosted. Don't sweat image noise. The nature of the dye sub process hides what you easily detect on screen in the continuous tone pattern. 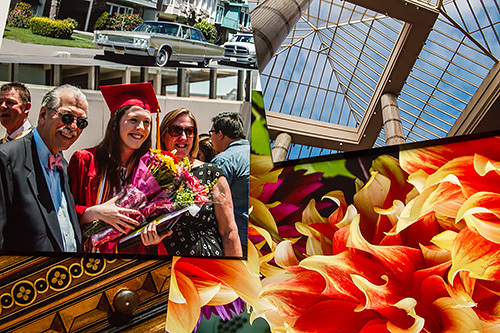 We used the DS40 for several months to print everything from event photography like a graduation to our annual holiday cards. The prints circulated among a large number of people as well, so we got a lot of feedback on their quality. Prints. Universal praise for the output quality, which we shared with a number of people. And that feedback was universal praise. Colors were bright and saturated, details were sharp. Apart from the nit-picking above about large gamut images, we were consistently pleased with the DS40's output. There were no surprises, no color shifts. Just credible color. Our event photography was always right on the mark. With a reliable setup (which was not easy to attain on OS X before the Yosemite beta driver), we never gave a second thought to the Print command. We simply made our edits, printed the image and, well, admired the output. Sometimes we admired the image so much, we printed it again at a larger size. The printer itself required no attention in moving from a 4x6 print size to a 5x7 print size to a 6x8 print size. And the output was consistent as well. We rarely felt the need to tweak the image to accomodate the printer, in fact. That's good news for a pro shop but it's also something any enthusiast and amateur would appreciate. No more wondering why the prints are so dark. We used the DS40 for several months and never had an issue with it apart from a dust speck we dealt with early on, which we suspect was induced by our product shots. We kept it well ventilated, which is worth pointing out for a device that prints with heat. But we were able to run off dozens of event photographs at one time without an issue. And whenever we turned it on, it was ready to go within a few seconds. 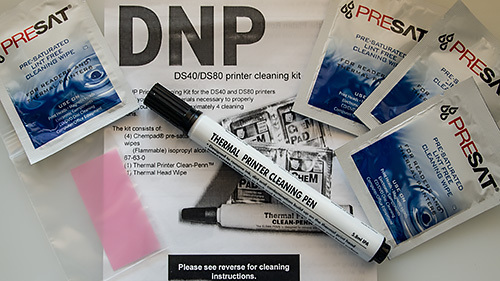 It was a welcome relief from the inkjet maintenance routines and careful handling required for the still-wet inkjet prints, some of which can not be handled for a day. We had to wonder if one-hour photo labs had been able to offer this level of brilliance would they ever have gone out of business. And we also had to wonder why DNP doesn't put together a smaller home-version of the DS40 (the DS20, say) to take the expense and mystery out of making prints for everybody. 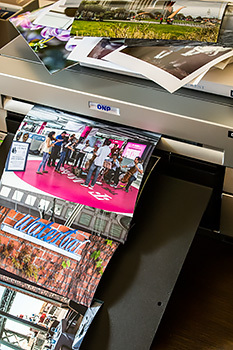 Actual print times for batch printing of 4x6 prints, which are printed two at a time, are 25 seconds for 1 and 2, 64 seconds for 3 and 4, 98 seconds for 5 and 6. That's about 15 seconds a print with data transfer taking 18-20 seconds before each set of two images. The DS40 prints two at a time to make full use of the ribbon, which can print as large as 6x8. The ribbon is also the reason you can't do endless panoramas on the DS40. You're restricted to the length of the ribbon's dye panels. We noticed a vertical white line going through a few prints during our first roll. There is nothing about this in the documentation and there's no online support to speak of. In fact, DNP expects you to contact technical support via the phone, which is more helpful than it sounds. Reviewers, you might suspect, have different resources. We used ours to avoid taking phone time from real customers, emailing tech support so they could reply at their convenience rather than ours. White lines on your prints is usually an indication the thermal print head needs to be cleaned with alcohol and a lint free cloth. Make sure that printer has been powered off for at least 15 minutes before cleaning to let the thermal print head cool down. The printer does come with a cleaning kit. And we might have used it but we had been opening the printer up more than you would if you were just using it as a printer. We had to do product shots of the printer, after all. So we suspected a bit of paper dust had found the wrong place to rest. We gave the innards a blast of compressed air and never saw the white line again. In fact, in our months of printing to the DS40, we had no mechanical problems at all. There are only two parts of the printer that may need maintenance (if you don't count emptying the scrap box of trimmings). Those are the platen roller and the thermal head. The cleaning kit includes instructions for both. Cleaning Kit. Four isopropyl alcohol wipes, a Clean-Penn, thermal head wipe and instructions. To clean the platen roller, you remove the paper cassette to access the roller and wipe it with one of the alcohol pads. To clean the thermal head, you remove the ribbon cassette to be access the thermal head in the back of the printer box. It's an orange strip, the instructions point out. Wipe it clean with the pen using a side-to-side motion. If you run across any debris in the head, you can dislodge it with a thermal head wipe but you should use the pen again after that. Simple enough for an assistant to do. Dye sublimation prints behave differently from injet prints. You are, for example, able to handle them immediately after they come out of the printer. Some inkjet prints can't be safely handled for 24 hours. So that makes a difference. Details were sharp, color was saturated and true within the gamut of the dyes. Black and white imaging was less satisfactory than color primarily because there is no black. So you are printing a quadtone, which we found fairly neutral, tending cool if anything. We framed a few prints under glass using mats to keep the prints from contact with the glass. We found prints that come in contact with glass will show a blue mottling. Other than that, the prints required no special handling. As the roll gets near the end, there is some curling but it was not much of a problem. You can decurl them by rolling them gently in the opposite direction of the curl or put them under a weight for a while to flatten them. After a few days, they flattened themselves with no intervention from us. Mobile Party Print is DNP's portable photography solution allowing anyone at an event to print photos wirelessly to a DNP printer from their portable device. The host software is installed on a Windows computer but client devices must also download and install an app. iOS devices should look for Party Print in the App Store, for example. The printer isn't really very portable (unless you have a strong assistant) but if you are able to move it from event to event, you'll want to also print a Windows laptop to run the host software that looks for images in a watch folder and sends them to the printer. It strikes us that Mobile Party Print could be emulated on iOS (and other devices) and Mac OS X. Mobile devices would have to be able to wirelessly transmit images to a specific MacBook Pro folder. There are some paid third-party apps that permit this. That folder would be watched by a Folder Action so on receipt of an image, it would send it to the connected DS40. We recently described how to very simply create a watched folder for printing, which we tested with the DS40. If you have trouble setting this up, we're available to help. Printing from the Finder using our Folder Action worked perfectly using the Yosemite driver. Printing single images from Photoshop CC 2014.2 worked perfectly. Printing a large selection of images from Lightroom 5 worked perfectly. Printing a single image from DxO Optics Pro 10 worked perfectly as well. So, on the whole, we had a more reliable printing experience using the beta driver on Yosemite than we had with the Lion-driver on Lion or Yosemite. We did get the not-connected status message, as DNP warned we would but it was not fatal. We'll conclude our review of the DS40 with a concise summary of our conclusions to make it easier to quickly evaluate the product for various needs.